I'm extremely happy to present this blog's first Off Topic post. While they will be far and few between, I always wanted to consolidate past articles I've written into one permanent place, regardless of their content. With that in mind, I now present an article I wrote back in 1997 for the Comics Buyers Guide 1. 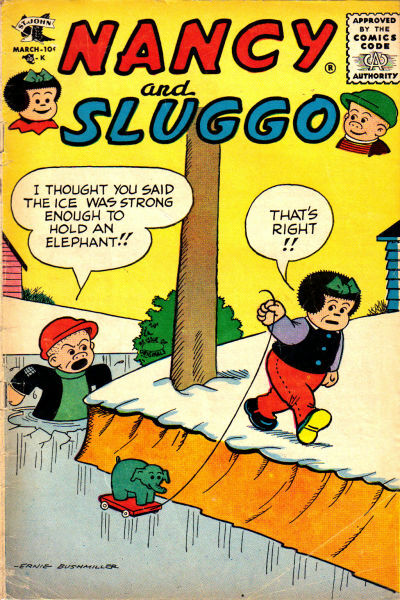 For the last 7 years it was hosted on my pal Ken Quattro's Comicartville site, a haven for wonderful comic-related articles that pre-dated the more recent blog era. I'm extremely appreciative to Ken for providing the space to me for all those years. 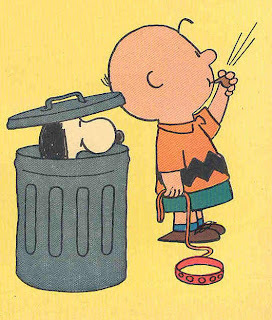 With the recent announcement of "new" Peanuts comics being released by KaBOOM! Studios, I thought this a perfect time to dust this article off once again. I'm leaving the main text of the article intact, only making a handful of updated credits. I will use many more examples of artwork than we were able to use in the past, though. 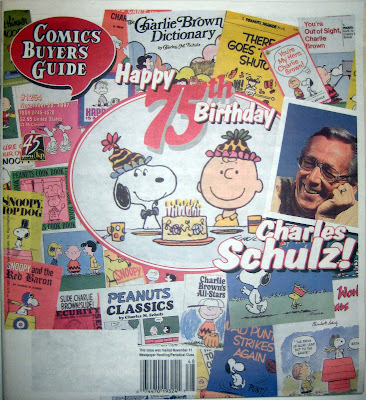 "This article below originally appeared in the November 28, 1997 issue (#1254) of the COMICS BUYER'S GUIDE on the occasion of Charles M. Schulz's 75th birthday. It was fandom's first attempt to collate all the information together about the comic book appearances of Schulz's Peanuts characters and I've left it as it was originally published except for the updated material where mentioned." 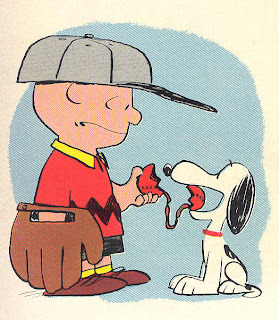 When Charles M. Schulz's comic strip Li'l Folks was finally accepted by United Features Syndicate, re-christened Peanuts and debuted in seven newspapers on October 2, 1950, little did he realize that from such humble beginnings would mushroom worldwide popularity and prominence over the next 50 years. Peaking in the 1960's, this wonderfully endearing slice of Americana has become an institution continuing to delight us to this date. 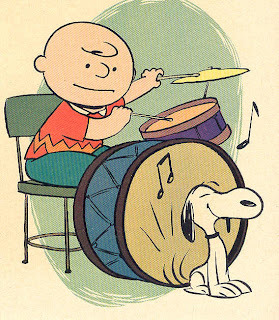 Peanuts can honestly claim the title of the worlds most successful comic strip, producing characters that will remain on the American landscape quite possibly forever. Much has been written about this strip: Precocious children interacting in a world where adults are never seen, the underlying level of pathos of its main hero Charlie Brown, and most phenomenally, the growth from a minor role to eventual stardom by his dog Snoopy. 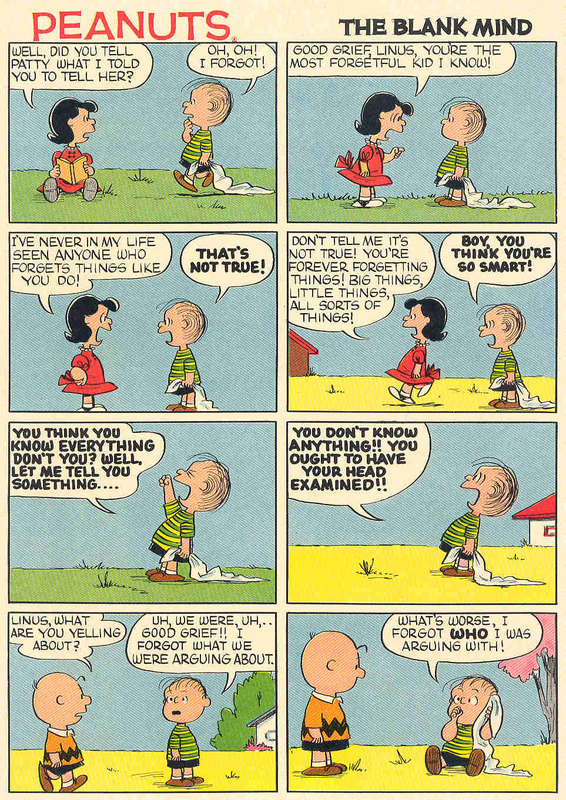 "Peanuts" is the template for all modern child-star comic strips that followed, up to and including today's precocious wonderkid, the almost equally phenomenal strip, the late and terribly missed, Calvin and Hobbes. 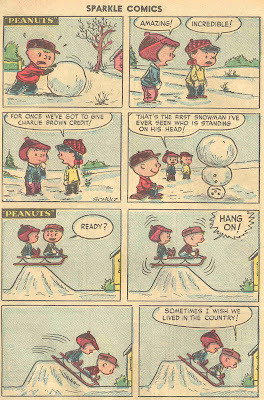 With all that said, and all that has been written about its place in comic strip history, I've seen little or no mention about Peanuts appearances in comic books. A period of intense research has produced the following information. 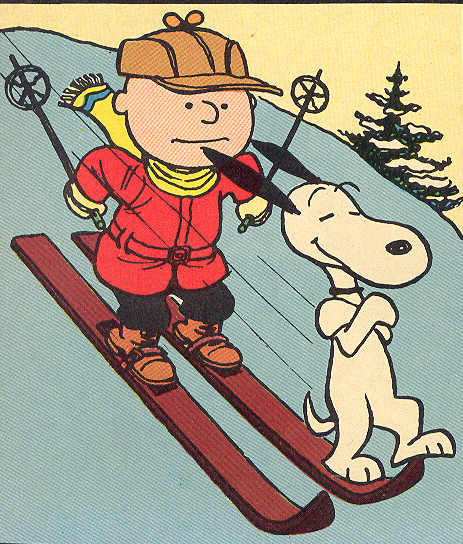 The earliest comic book appearances of Peanuts have a somewhat cloudy chronology and there has long been some question to its origins as I've found many factual data errors and omissions in the annual Overstreet Price Guide. Based on this fact, Overstreet mentioned appearances will be accepted but confirmation will await further discovery as I continue to locate a few remaining books. The information that follows is as up-to-date as possible. (U.F.S.) 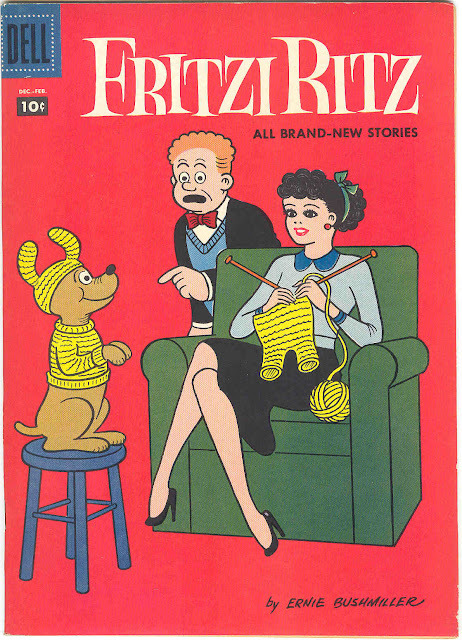 (1952-1954), which published a line of comics including TIP TOP, TIP TOPPER, UNITED COMICS, FRITZI RITZ, SPARKLER COMICS, SPARKLE COMICS and PEANUTS (a Comics On Parade one-shot). 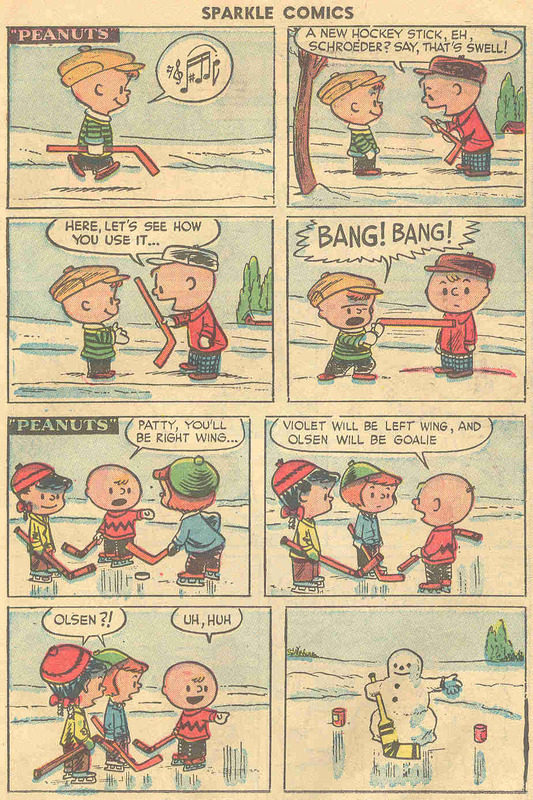 These were United Feature Syndicate newspaper strip reprints of early 1950's newspaper comic strips. 2) St. John (1955-1957), after a 7 month hiatus, followed when U.F.S. 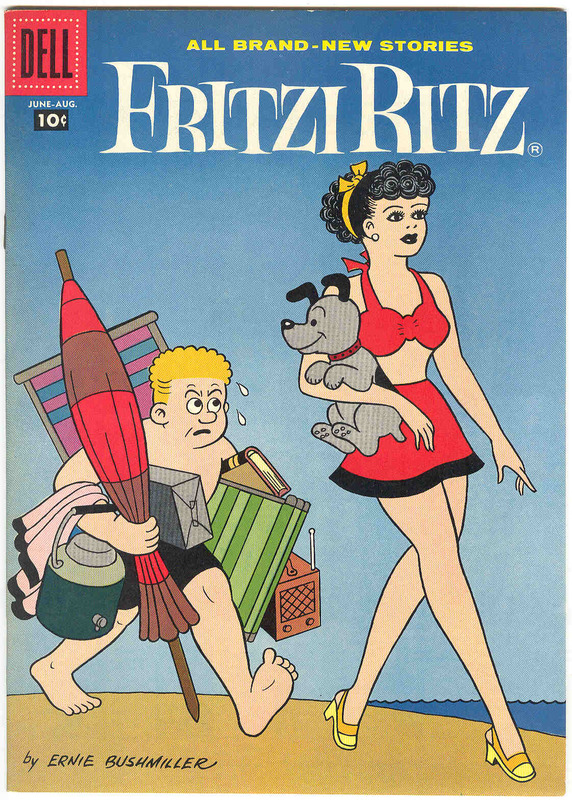 ceased publishing and continued with TIP TOP and FRITZI RITZ. 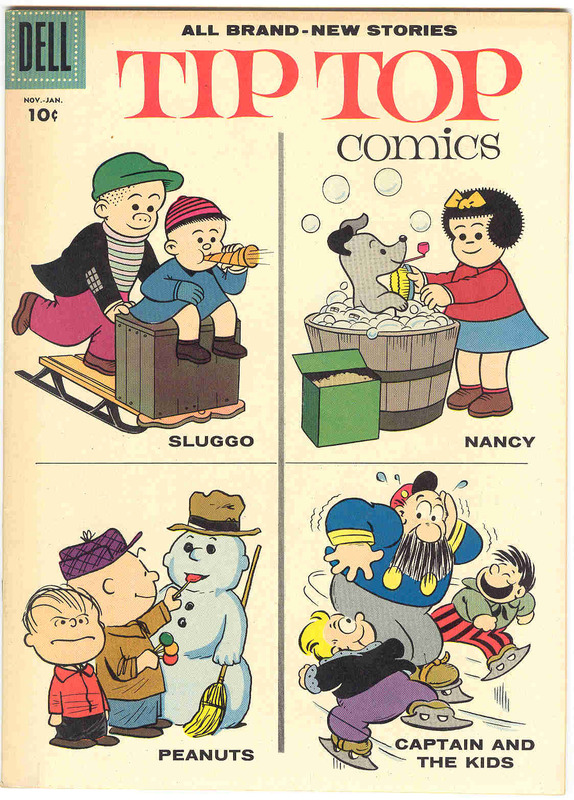 These appear to be Fritzi Ritz and Nancy & Sluggo reprints from earlier U.F.S. issues. 3) Western, under its Dell imprint (1957-1962), after another hiatus, began the third wave with NANCY (Sept/57), then continued withTIP TOP (Nov/57), FRITZI RITZ (Dec/57), FOUR COLOR (1958), and finally PEANUTS (1960 ). This is all new material created exclusively for the comic books. 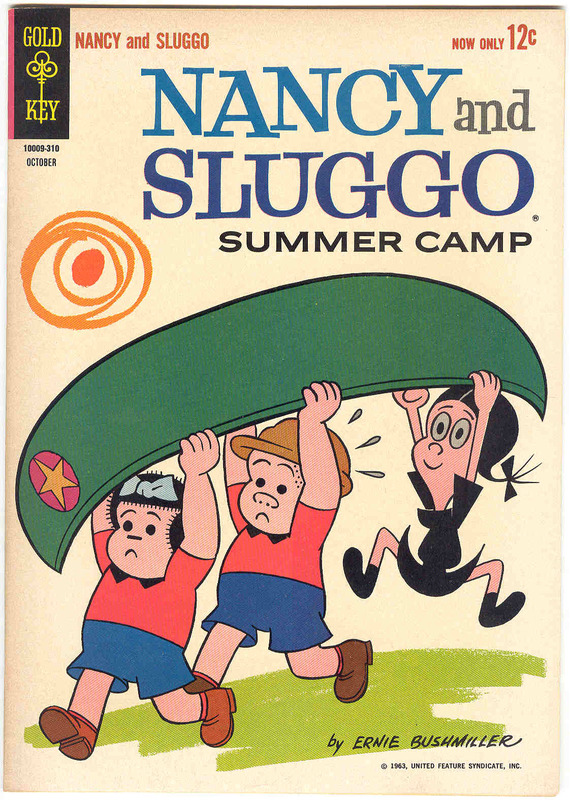 4) Western under its Gold Key imprint (1962-1964), which continued the numbering from the Dell title NANCY & SLUGGO and a new, re-numbered PEANUTS. Notable of these issues is the fact that they are primarily re-packaged Dell reprints. 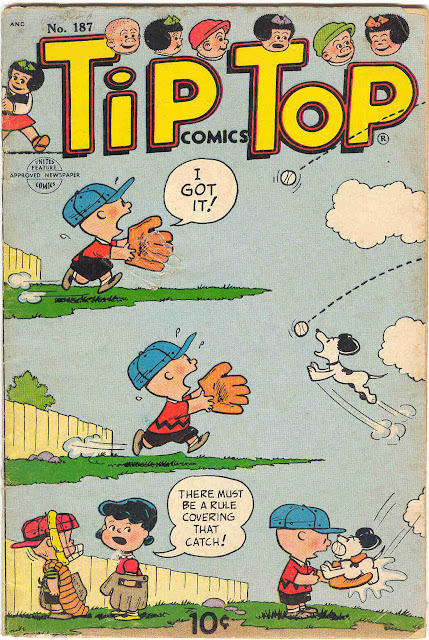 "Peanuts" characters quietly made their comic book debut simultaneously in the Mar/Apr, 1952 issues of TIP TOP COMICS #173 and UNITED COMICS #21. These appearances were not mentioned in Overstreet back in 1997 and discovered by myself. 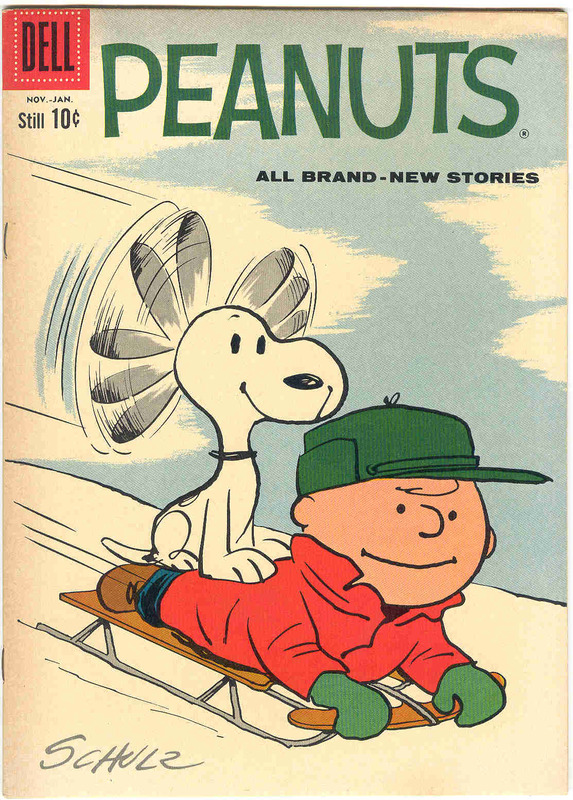 Timeline research, through an exhaustive search of all United Features Syndicate contemporaneous titles and issues, has placed TIP TOP COMICS #173 and UNITED COMICS #21 as the earliest "Peanuts" appearances, chronologically pre-dating all other appearances. TIP TOP COMICS was a long running title stretching back to 1936 and lasting 225 issues to 1961. 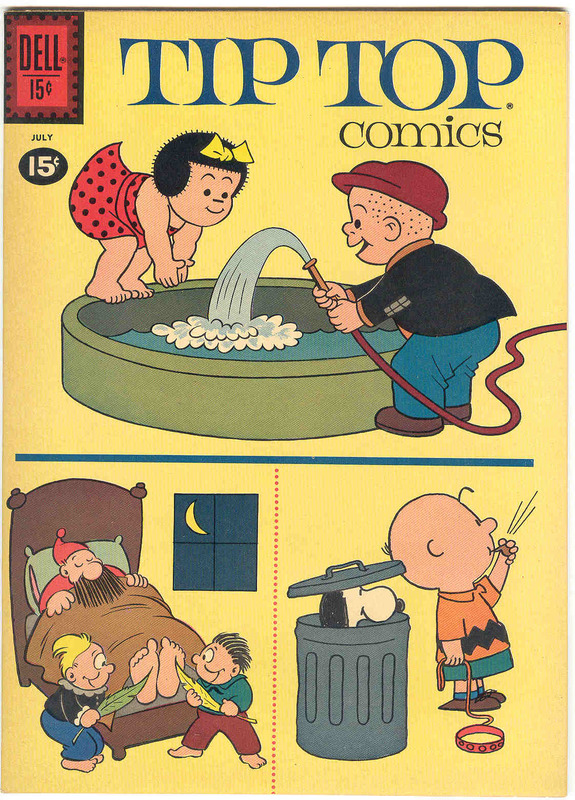 United Feature Syndicate published #1 -188, St John published #189-210, and the last 15 issues 211-225, (1958-61) were published by Dell, featuring new story art "not" by Charles Schulz. I will explain this shortly. 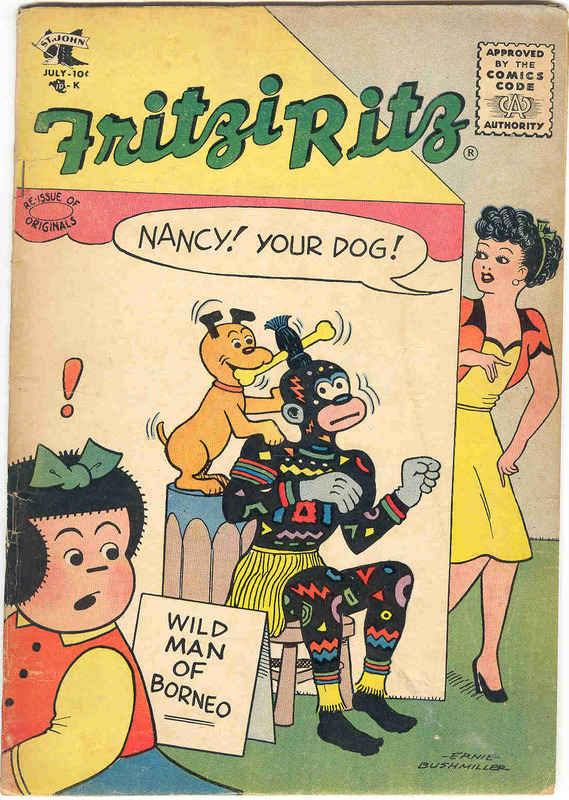 This title over its history featured Hal Foster's "Tarzan", "Li'l Abner", "Fritzi Ritz", "Nancy", "The Captain and the Kids", "Peanuts", and historically speaking, the first published art of Jack Davis (#32, Dec/38, a Buffalo Bob's Cartoon Contest winner, age 12) and first comic work by Harvey Kurtzman (#36, Apr/39 ). 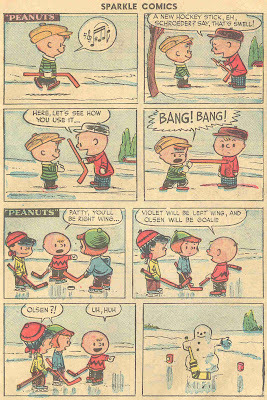 The Peanuts appearance history in TIP TOP COMICS begins haphazardly. 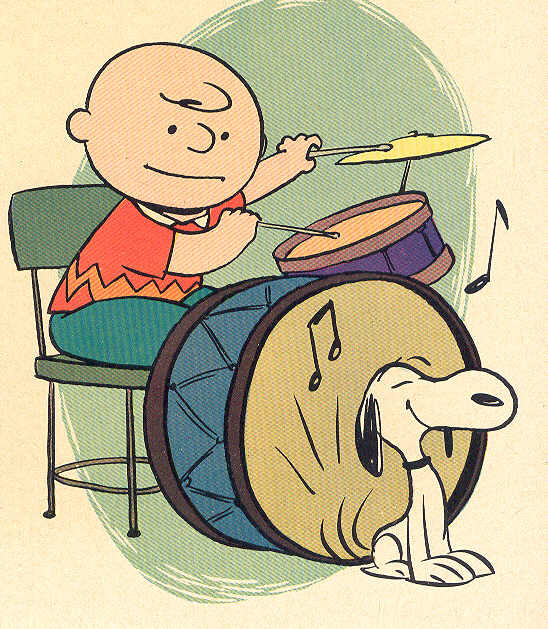 I've established #173 as co-debut and confirmed that #174-183 do not feature Peanuts. #184-188 do feature Peanuts and complete United Features Syndicate's run of the title, including adorable covers to #185-188. St. John's entire Tip Top run features Peanuts from #189-210 and Dell's run from 211-225 likewise. The St. John material is reprinted from earlier United Features Syndicate Tip Top issues. Issue #173 consisted of two 4-panel, half-page daily strip gags, but by #185, along with being cover featured, Peanuts inside received four full pages of daily and/or Sunday strip reprints. UNITED COMICS (starring Fritzi Ritz) and FRITZI RITZ were two intertwined titles that presented comic strip characters owned by United Feature Syndicate, most notably Ernie Bushmiller's Fritzi Ritz, a leggy "good-girl art" humor character who happened to be the aunt of Nancy of Nancy and Sluggo fame. The Overstreet Guide misses UNITED COMICS Peanuts appearances in issue #21 to this day (15 years after this article first saw print). The St. John issues are reprinted material from earlier United Features Syndicate United Comics and Fritzi Ritz issues. Dell Fritzi Ritz #56 is the only Dell issue missing Peanuts. 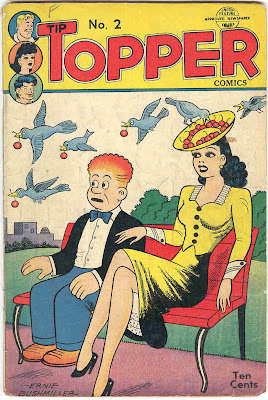 The Dell issues #57,58,& 59, contrary to all the earlier issues, and similar to the Dell TIP TOP issues mentioned above, have new material exclusively created for comic books. Again, story art is not by Charles Schulz. Each of these issues have a single 4-page story. 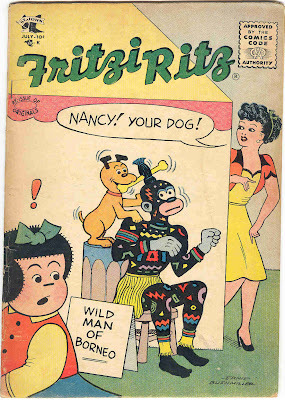 As can be seen above in the St. John Fritzi Ritz #44 (July/56), contemporary racial stereotyping can be found even in post-code comics aimed at the youngest segment of the comic reading audience. 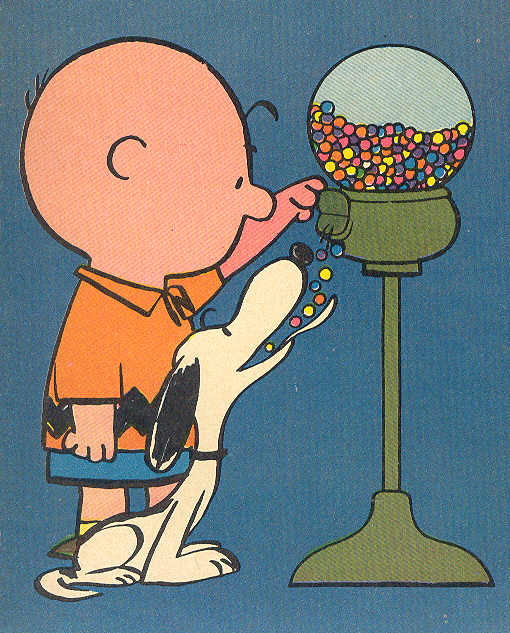 Historically, collectors looking for Peanuts in comic books faced an arduous task as the feature appeared haphazardly without any real pattern or sequence. The next title where Peanuts appeared was TIP TOPPER COMICS, published by United Feature Syndicate and running 28 issues from 1949-54, comprising more United Feature Syndicate newspaper comic strip characters including Li'l Abner, Abbie & Slats,Fritzi Ritz, Curley Kayoe and Peanuts in issues #16-22, 24-28. The Peanuts are newspaper strip reprints and are 4-panel dailys and/or Sundays over two pages. 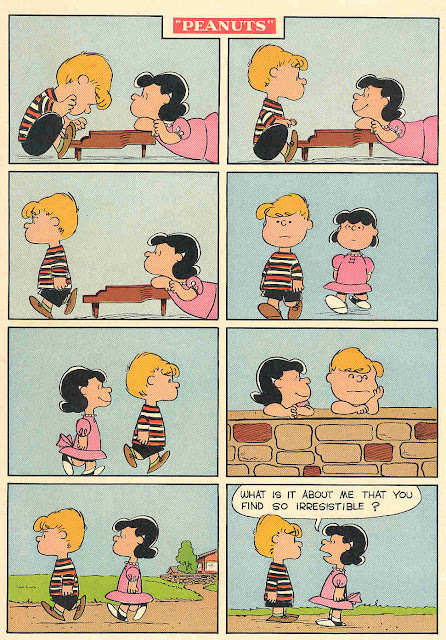 There are a couple of additional Peanuts strip appearances. 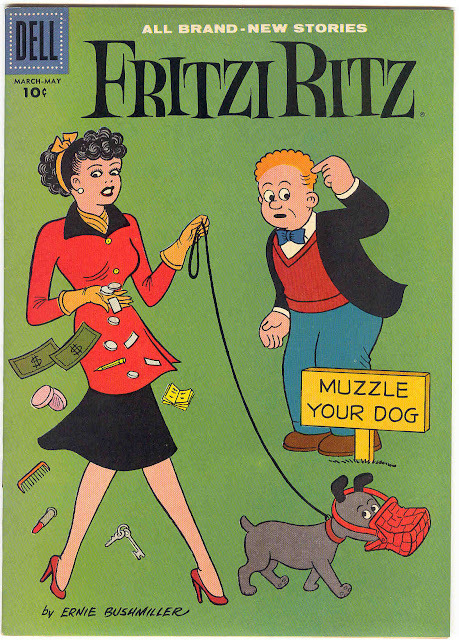 United Features Syndicate's Sparkle Comics ran 33 issues from 1948 to 1954. 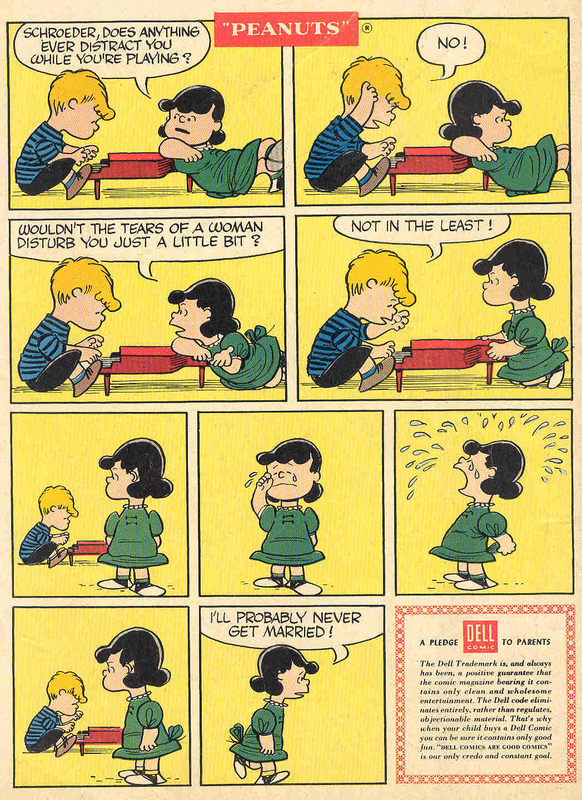 The very last issue, #33 (Feb-Mar/54) had Peanuts. 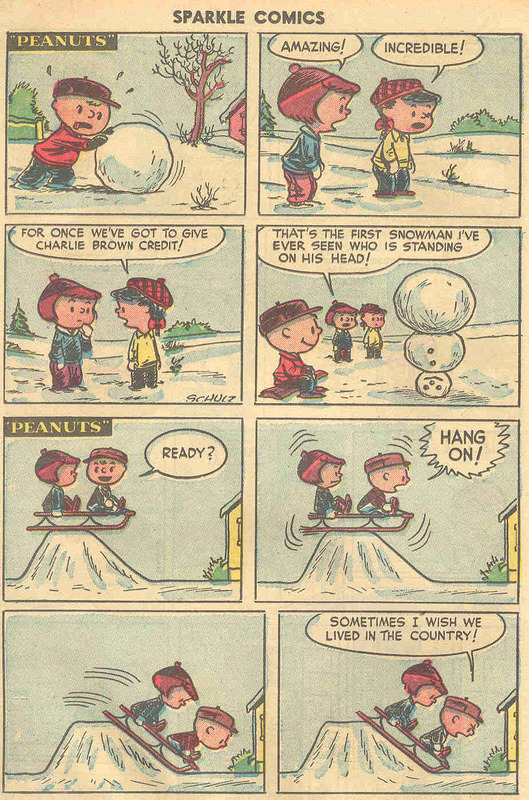 Could there be Peanuts is earlier issues not known about? I think yes as I've not looked in all the issues. 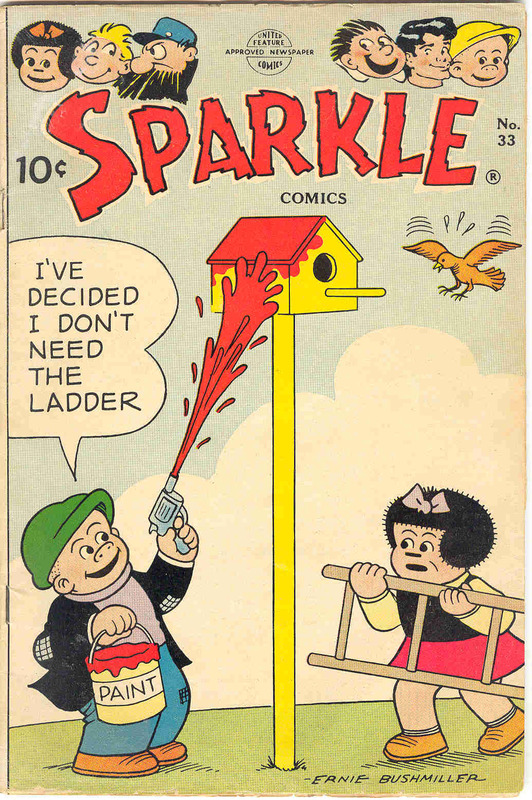 United Features Syndicate's Sparkler Comics ran two volumes. The first volume ran only two issues in 1940. 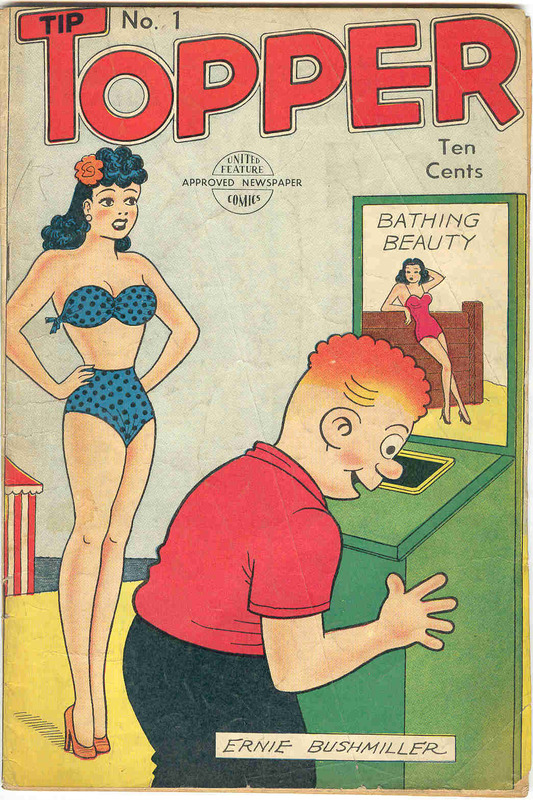 Volume two ran 120 issues to cover date Oct-Nov/54. 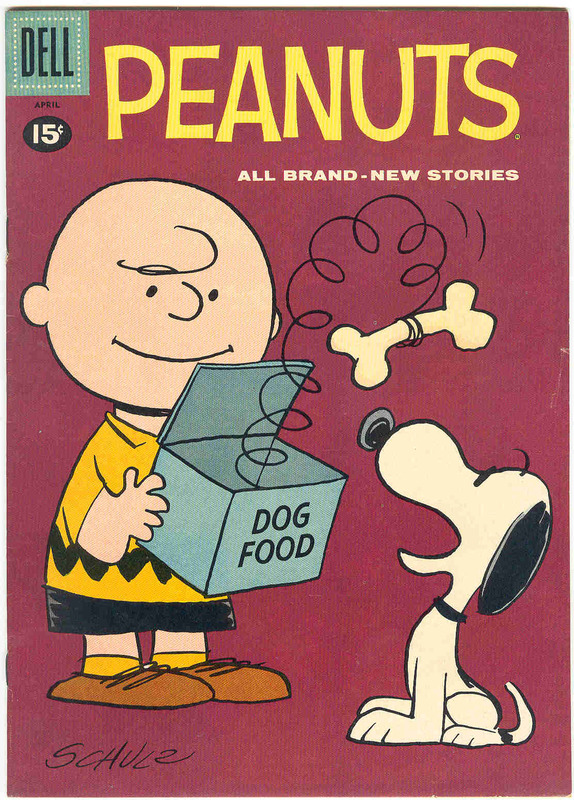 Two issues are known to contain Peanuts, #115 (Jan-Feb/54) and #120, (Oct-Nov/54). There could be others. 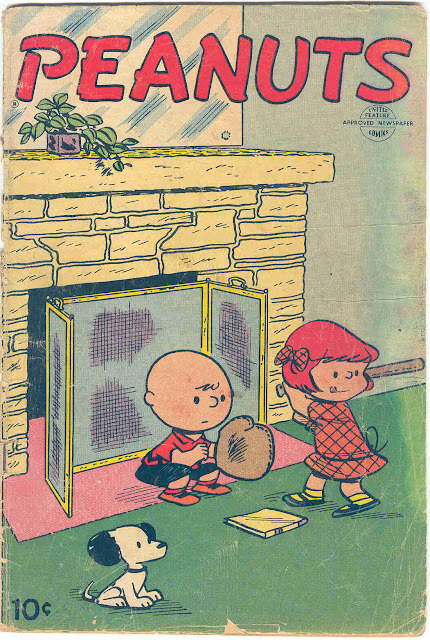 Sparkler Comics #115 (Jan-Feb/54) "Peanuts"
Sparkler Comics #120 (Oct-Nov/54) "Peanuts"
Nancy and Sluggo had two separate runs. 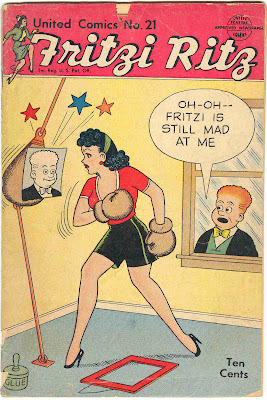 The first ran #16 (#1) - 23 from 1949 to 1954 by United Features Syndicate. 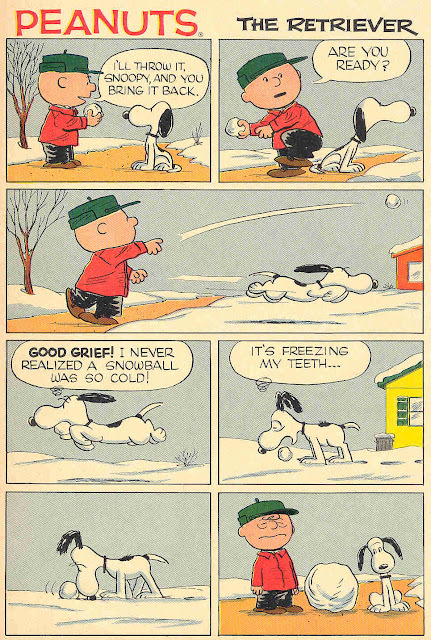 The second continued the numbering from Sparkler Comics above running from #121-145, published by St. John. 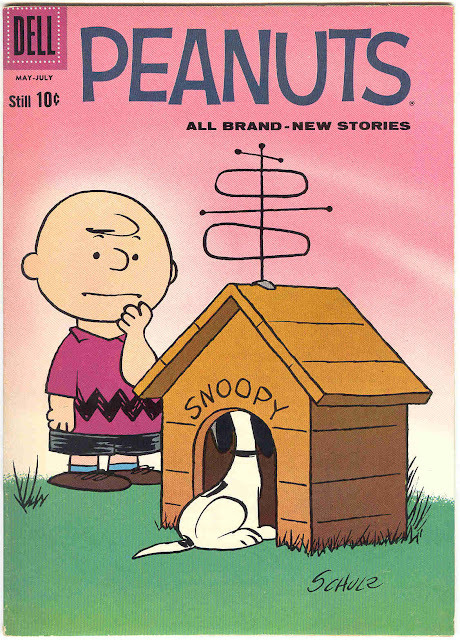 Issue #142 (Mar/55) contains Peanuts. 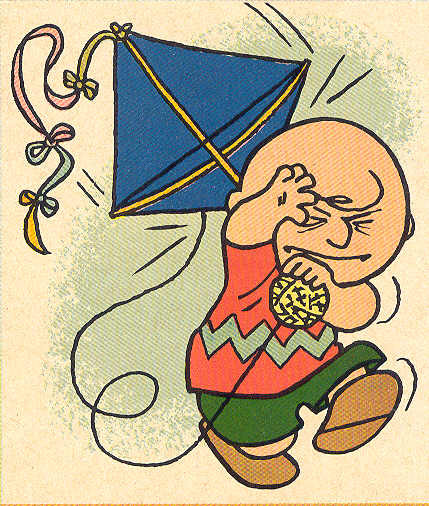 As with Sparkler Comics and Sparkle Comics above, there could be additional Peanuts here in issues not seen. Nancy will continue being published by Dell starting with #146 (Sept/57) to #173, then changes back to Nancy and Sluggo #174 to #187 (Apr/62) and then published by Gold Key #188-192. All these issues have new Peanuts material created especially for the comic books not by Charles Schulz, with "one" exception I will show below. 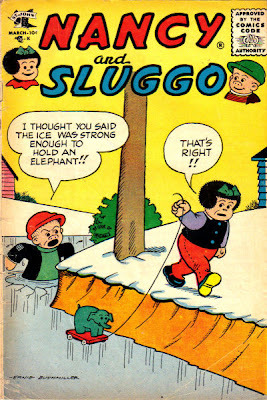 Nancy and Sluggo #142 (Mar/57) "Peanuts"
And finally, finishing out the early United Features Syndicate and St. John reprints of Peanuts newspaper strips is a real unique one-shot simply titled PEANUTS, although the indicia states Peanuts No.1, Comics on Parade. 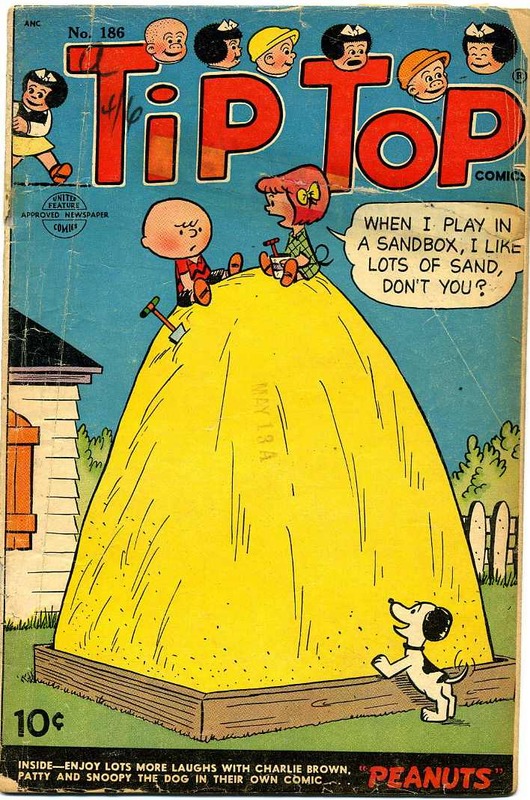 The date of this book appears to be from 1953-54 and contained strip reprints such as Willie, Ferdinand, and Strange As It Seems, as well as the earliest Peanuts strip reprints I've ever seen in a comic book, from the dawn of the strip perhaps in late 1950, early 1951.The material is copyrighted up to 1953 by United Feature Syndicate. 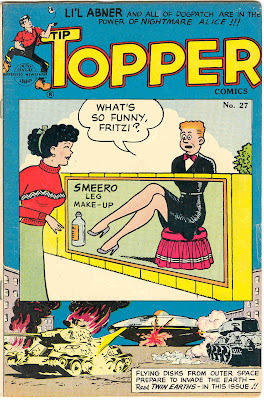 My guess is that it just pre-dated TIP TOP #184 and FRITZI RITZ #32 (both Jan/Feb, 1954) and followed TIP TOPPER #26 Dec/Jan, 1953, the final TIP TOPPER appearance. Any other suggestions are welcome. 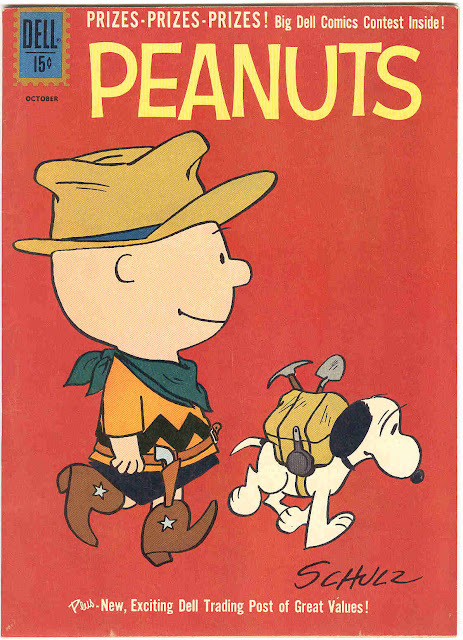 The cover below is a rarely seen slice of Peanuts wonderment by Charles M. Schulz. When Dell took over publishing NANCY COMICS in 1957 from St. John, Peanuts appeared in the entire run from #146-187 (1957-62), with Gold Key publishing the last five issues #188-192 (1962-63). 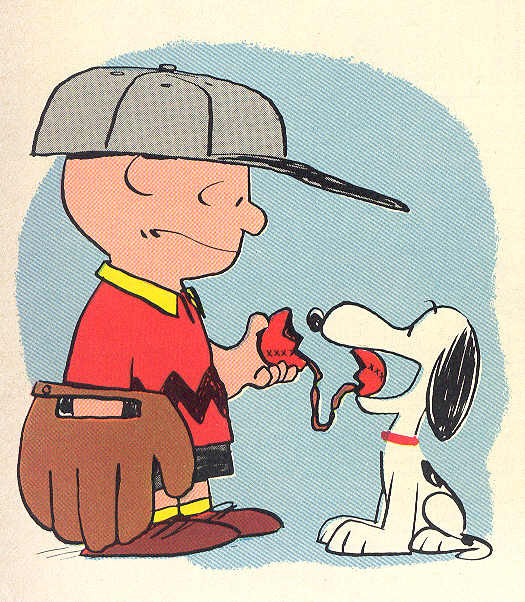 These Dell issues again, with a single exception, were not drawn by Charles Schulz. All consisted of four-page, self- contained gag stories. 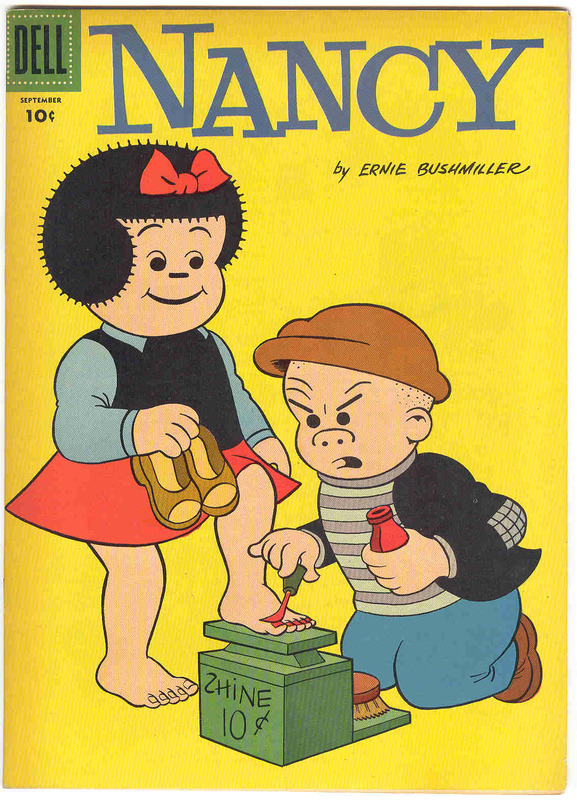 As mentioned above, NANCY COMICS began as SPARKLER COMICS, running120 issues from 1941-55. It featured the first appearance of "Sparkman" as well as more United Feature Syndicate characters such as Burne Hogarth's Tarzan, The Captain and the Kids, Ella Cinders, Danny Dingle, Frankie Doodle, Abbie and Slats, Broncho Bill, Li'l Abner, Fearless Fosdick and Nancy by Ernie Bushmiller. 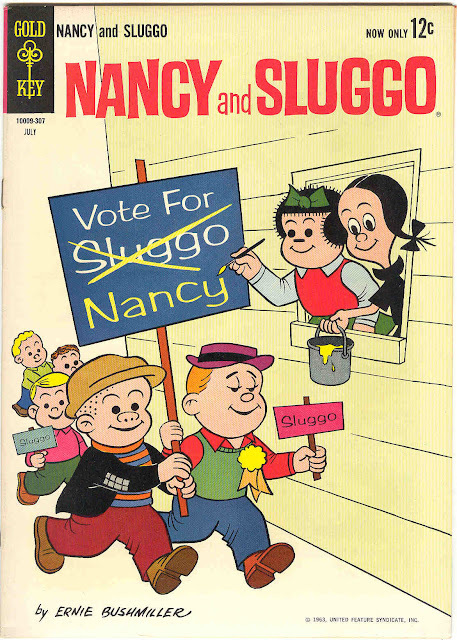 The title became NANCY with issue #121 in 1955, occasionally titled NANCY & SLUGGO throughout the run. Researching this article made it obvious, as mentioned, that the long multi-paged "Peanuts" stories found in the Dell issues of FOUR COLOR, PEANUTS, NANCY, TIP TOP & FRITZI RITZ (as well as the reprinted Gold Key stories) had been drawn by someone other than "ol Sparky" himself, Peanuts creater Charles M. Schulz. 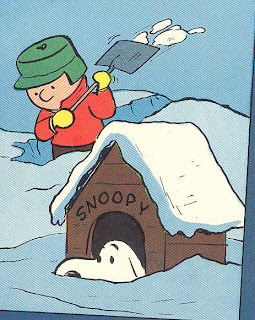 Upon reviewing these stories one could see this, as some stories have backgrounds that don't appear as if drawn by Schulz. Also, occasionally actions and dialogue in these extended stories appear slightly "out of character" if you will, compared to their newspaper counterparts. 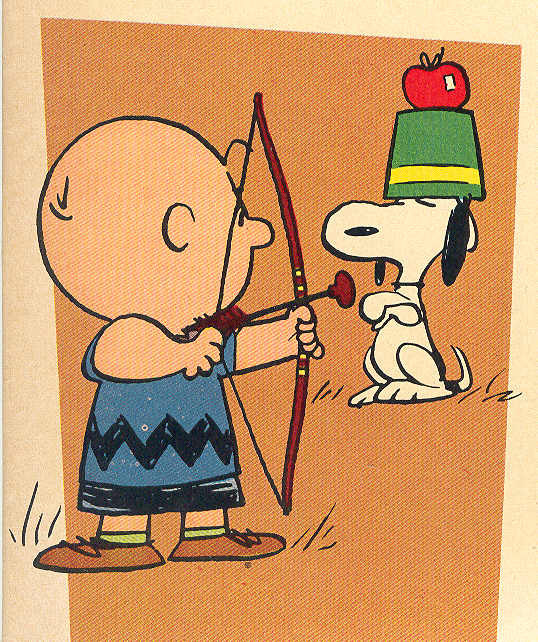 I've always been under the impression that Charles M. Schulz always drew and directly supervised all aspects of his strip and characters, so this was something of a surprise. 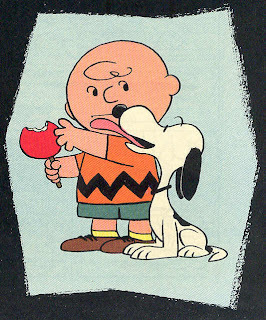 From a variety of sources, I learned that these DELL issues were produced by a crew of artists working for Schulz and who did advertising artwork for him. The main artist was Dale Hale. This information has been confirmed for me by the late comic strip art collector/historian/agent Mark J. Cohen, who was gracious enough to ask Charles M. Schulz over dinner about his contribution to those Dell issues. Mr. Schulz enumerated that he did the very first one himself with Jim Sasseville doing the next few and Dale Hale doing all the rest. 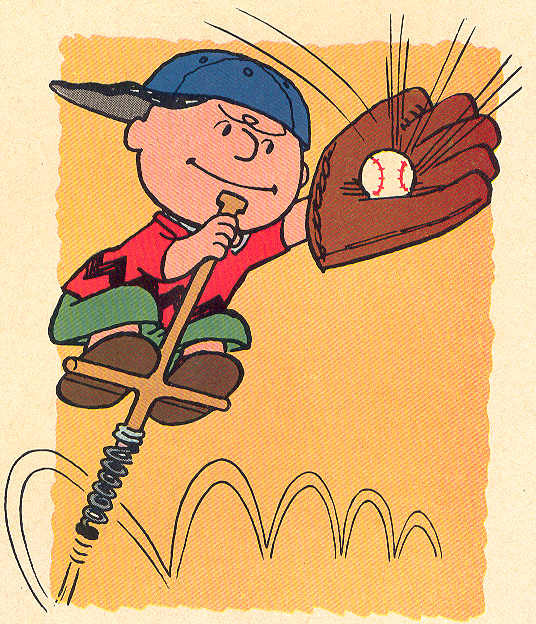 In fact, Sasseville was working with Schulz between 1957 and 1959 on a single-panel sports cartoon feature titled "It's Only a Game" that ran three times a week. 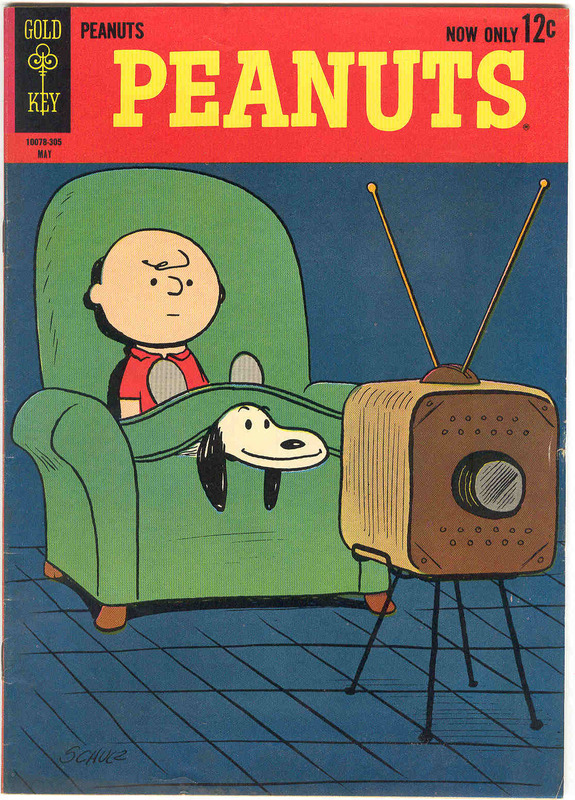 It was cancelled after 63 weeks in 1959. Schulz's claim to have drawn the first issue was not clear to me. 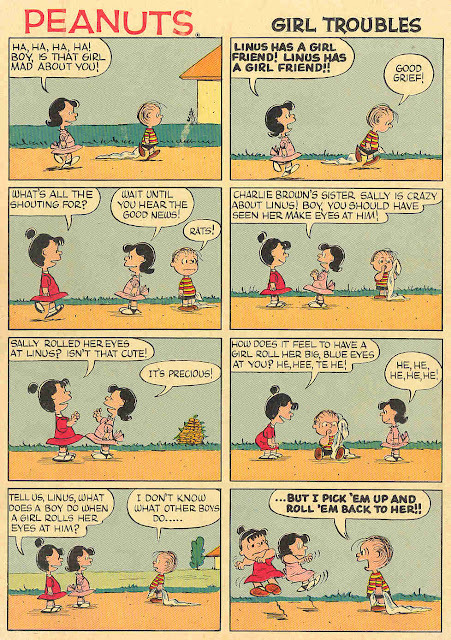 Chronologically, NANCY #146 (Sept/57) is the first Dell appearance of Peanuts. 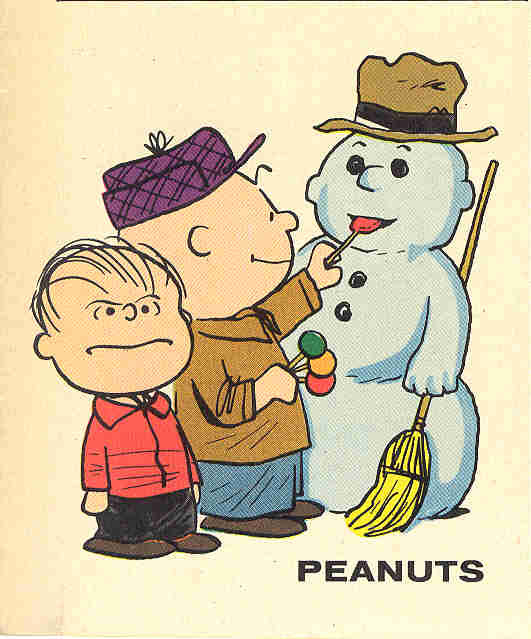 The first FOUR COLOR Peanuts issue,#878, appeared cover dated in 1958. 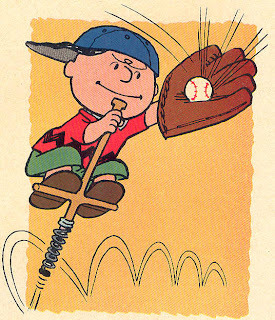 Going back to examine all these issues one at a time has led me to believe that Schulz was right on the money. 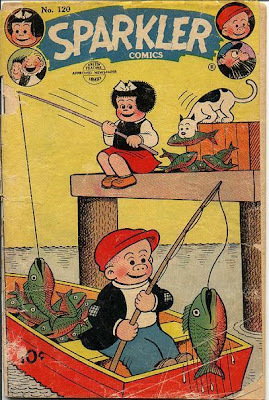 NANCY #146 really looks like Schulz's work. 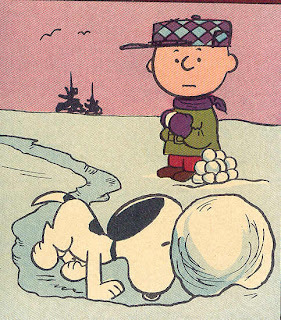 #147 definitely is not Schulz but #148 may be . Nothing else . FOUR COLOR #878 (1958) likewise is not, nor are any other Dell or Gold Key issues. Of major note also is that much of the non-Peanuts material in Nancy was written by John Stanley, who also introduced Oona Goosepimple into the series. (With the more recent addition to the list of NANCY #142 and SPARKLE COMICS # 33 and SPARKLER #115 and 120). 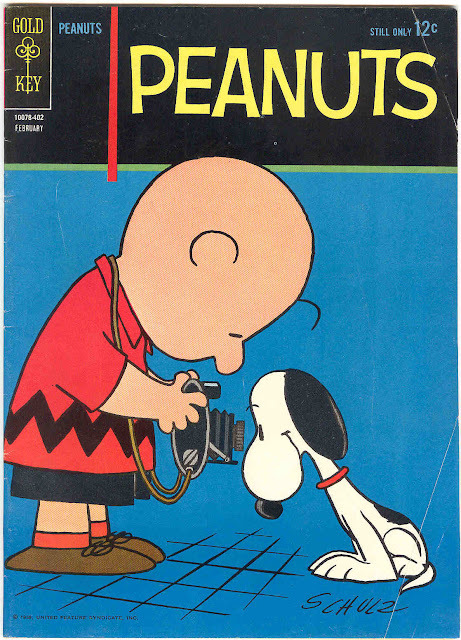 All these covers are beautiful wonderlands of intense and bright colored backgrounds with large signed simple Schulz drawings of Charlie Brown and Snoopy on every cover. 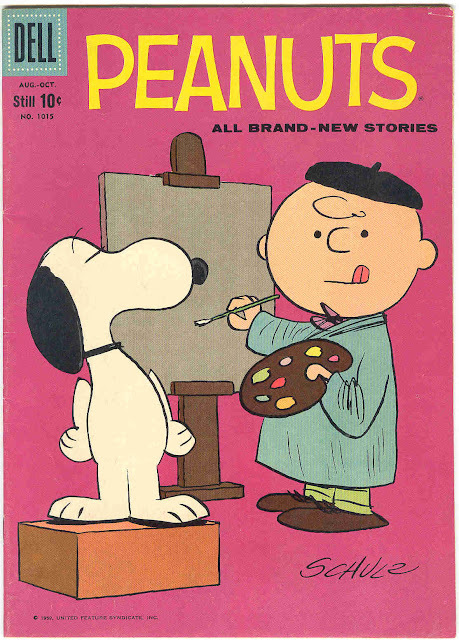 I once owned a copy of the debut 4-color issue below that someone had drawn glasses and an angry face over Charlie Brown in ballpoint ink. 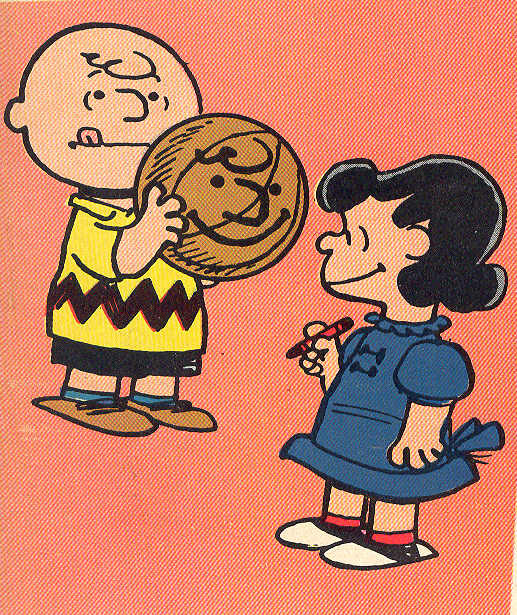 It scared the hell out of my then 3 year old daughter Michelle who adored the Peanuts characters in their animated cartoons on television! Now 20, she still remembers it! The stories in these issues vary in length , some up to 8 pages long. 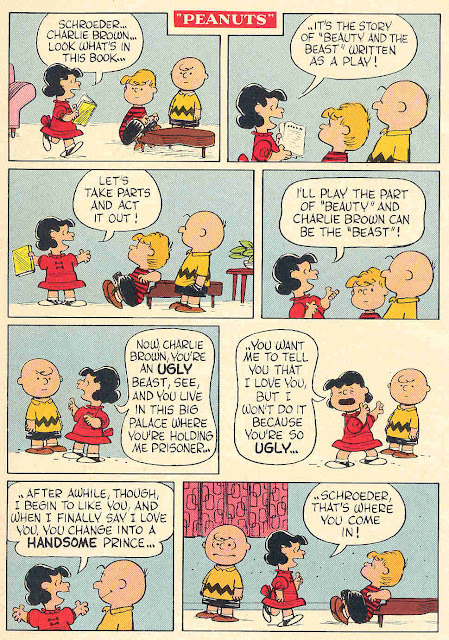 A peculiar anomoly should be noted about PEANUTS issues #4-13. The back covers seem to exist in two variants. 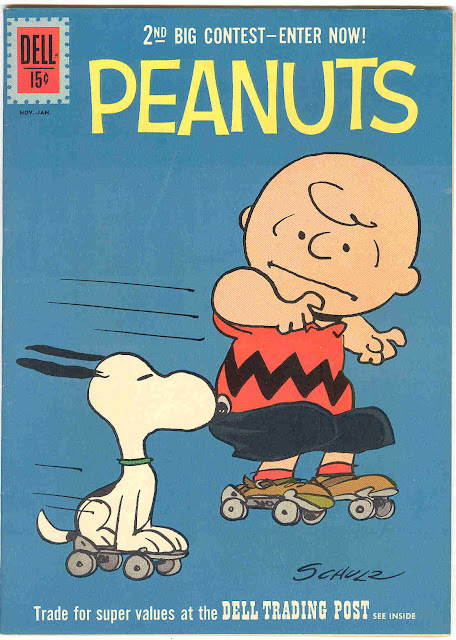 One is simply a full page advertisement for candy, breakfast cereal or children's toy, but the other is a full page Peanuts gag strip similar to those found on the inside front or inside back covers. Both variants are of the same printing. 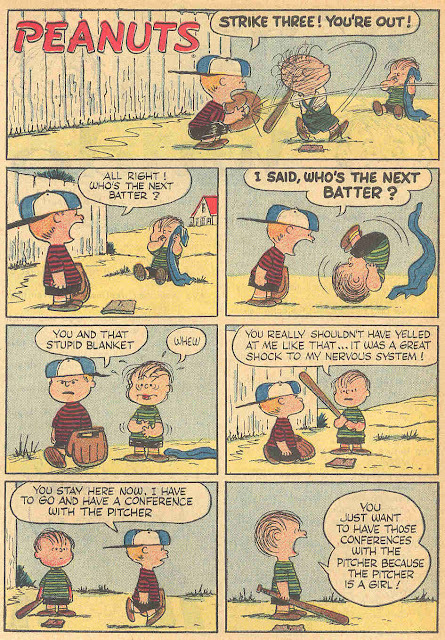 This was a common occurrence in all Dell issues published from mid 1956 on. 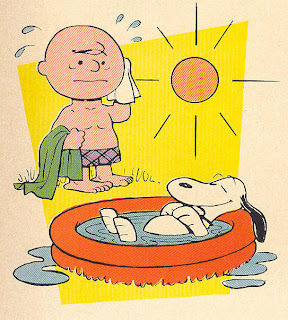 Not having both types to compare, I don't know whether the Peanuts back cover actually has an additional page of Peanuts material or not. I'll post what I have and if anyone can compare to theirs and give me feedback, I'd appreciate it greatly. 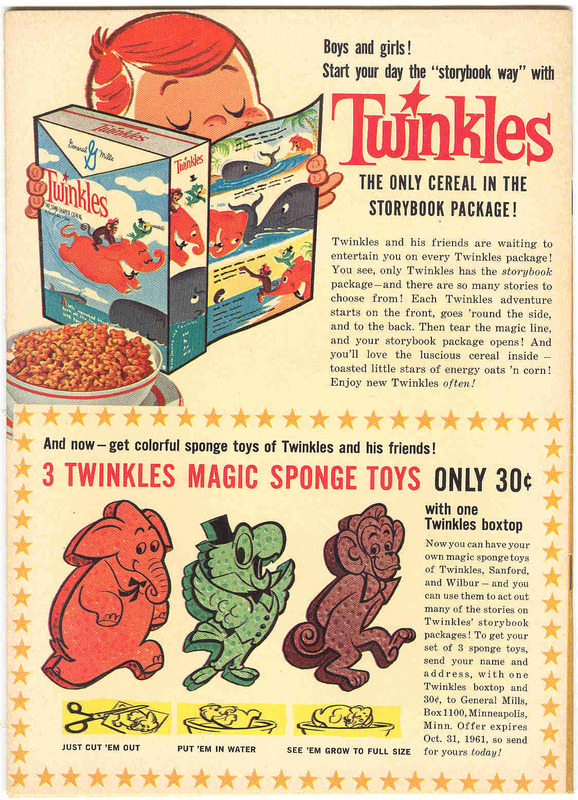 Ok, it's not Peanuts but I love old cereal ads! Anybody remember what Twinkles tasted like? 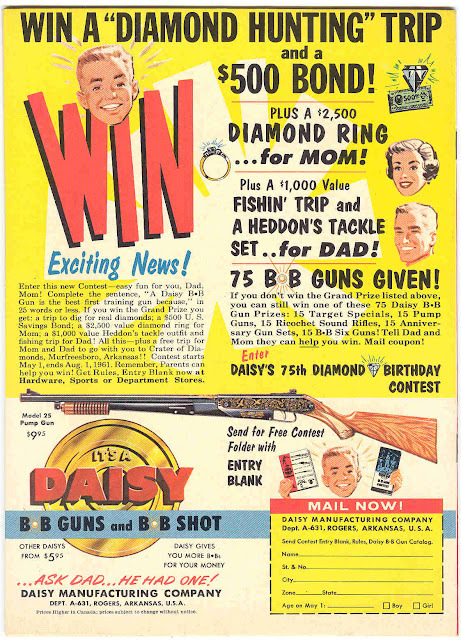 And remember when kids could buy BB rifles through the mail from a comic book ad? 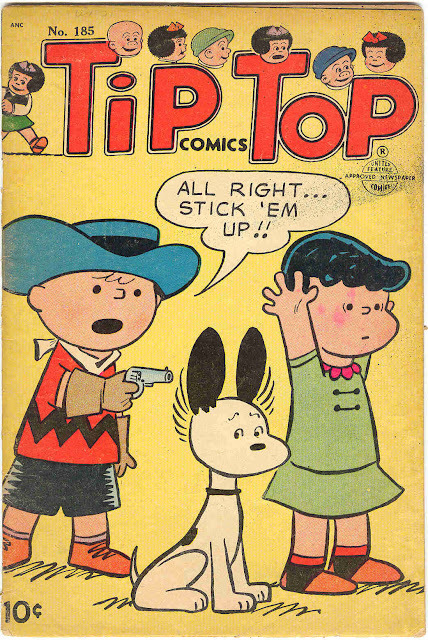 The Dell issues of Tip Top Comics ran 15 issues from #211 (Nov/Jan/58) to #225 (May-July/61) before the axe fell. 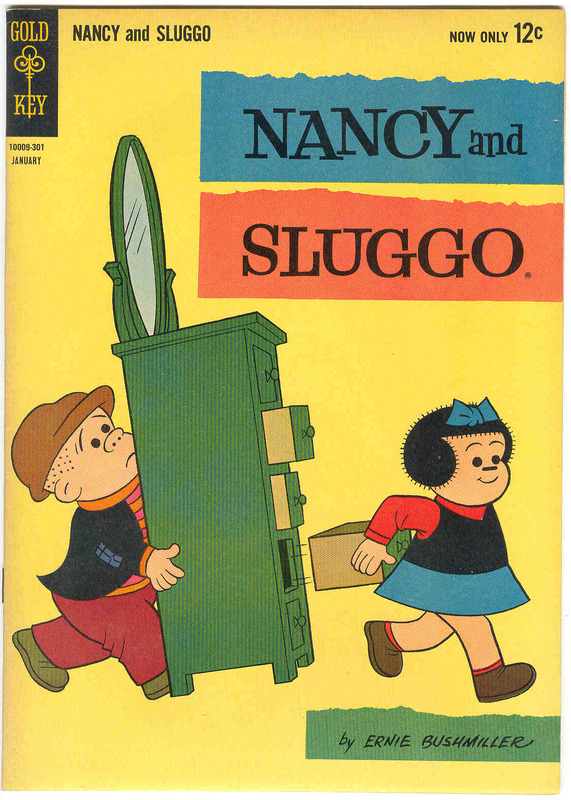 The entire run consisted of just three main features : Nancy & Sluggo, Peanuts and The Captain and the Kids. Peanuts was usually an 8 page story in the middle of the book. All the covers were vignette covers so Peanuts appeared on all 15 covers as one of three small cover depictions per issue. Tip Top Comics #211 (Nov-Jan/58) ; "Peanuts"
The final Dell title to examine is the 4 issue run of Fritzi Ritz, #56 (Dec-Feb/58) to #59 (Sept-Nov/58). 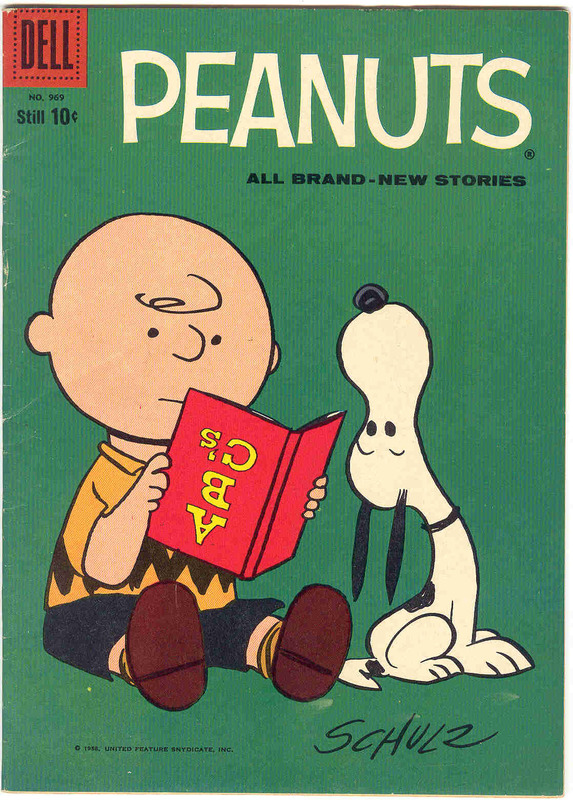 Peanuts can be found in #57,58,59 and run a total of one 4-page story per issue. 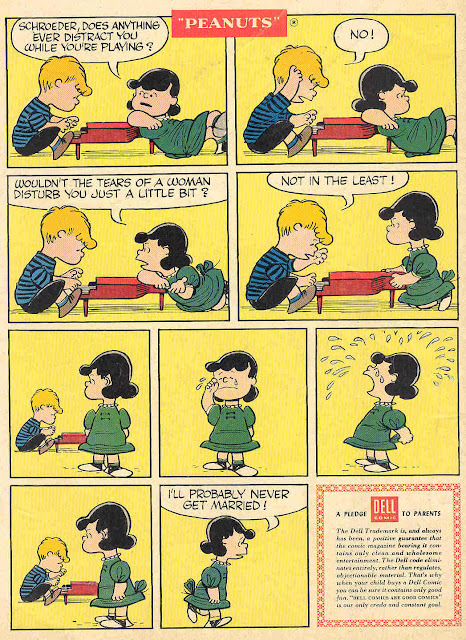 Fritzi Ritz #57 (Mar-May/58) ; "Peanuts"
Fritzi Ritz #57 (June-Aug/58) ; "Peanuts"
Fritzi Ritz #59 (Sept-Nov/58) ; "Peanuts"
The final "Peanuts" comic book appearances are the 4-issue Gold Key run titled PEANUTS (1963-64) which overlaps and outlasts the last 5 issues of NANCY and SLUGGO #188- 192 (1962-63). The Gold Key PEANUTS issues are nothing more than reprints of the first four issues published by Dell, Four Color #'s 878, 969, 1015 and PEANUTS #4, minus the Nancy and Sluggo story. 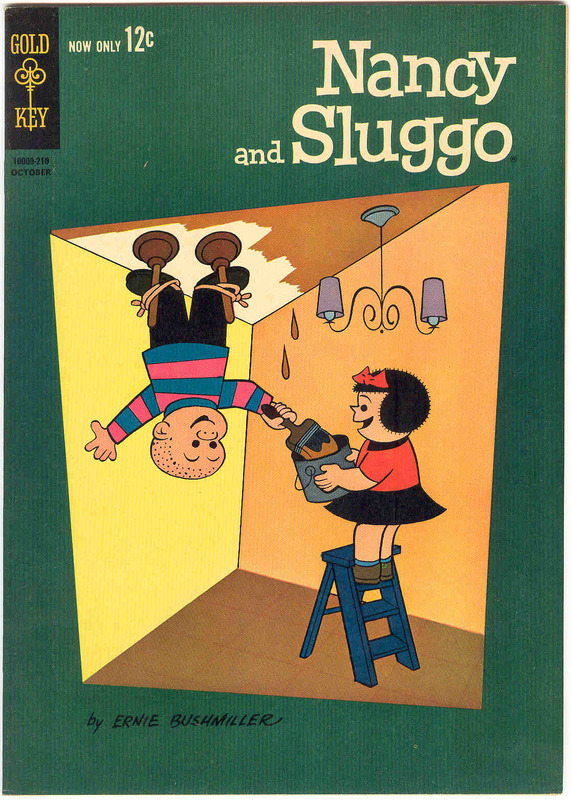 I suspect the Nancy and Sluggo issues are reprints also. One nice feature of the Gold Key PEANUTS (1-4) and NANCY and SLUGGO (188-192) issues are the fact that the back covers are pin-ups of the front covers minus the title and copy, which gives these books a very neat "wrap-around cover" appearance. 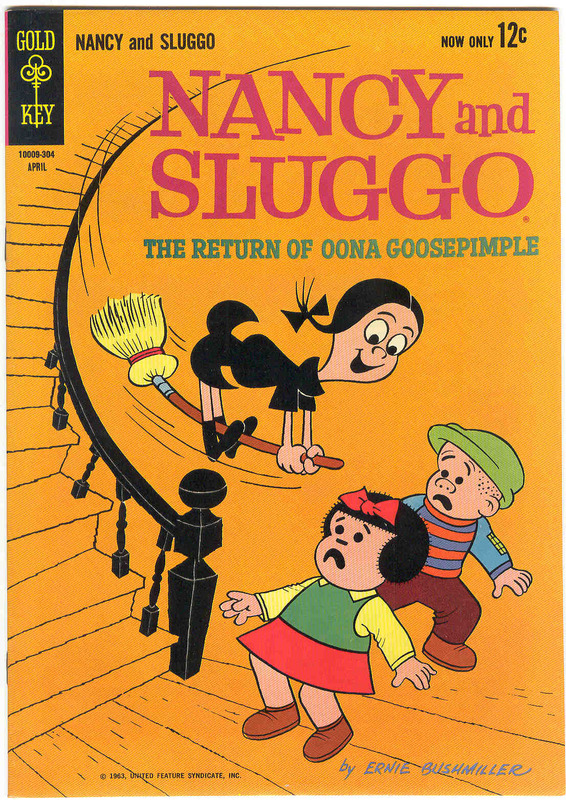 John Stanley scripted the Nancy stories and we will see the appearance of Stanley's Oona Goosepimple in the Gold Key issues below. The artwork is Dan Gormley. 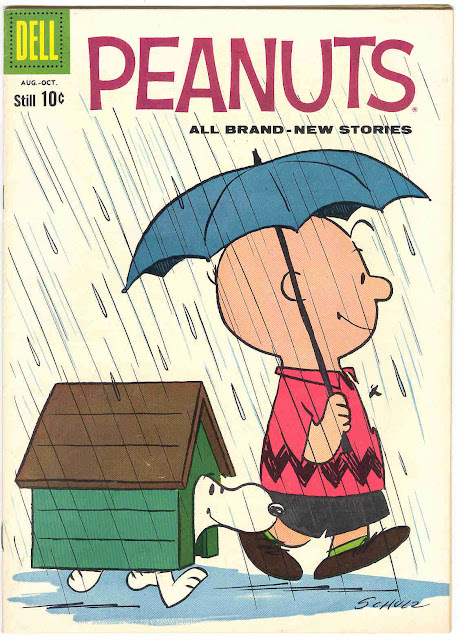 I'm betting there are still some Peanuts appearances to be found in United Features Syndicate and St. John issues of titles like Nancy, Sparkler Comics and Sparkle Comics, but for the most part, 99% of it is now accounted for. If anyone notices any errors or has any additions, please let me know. 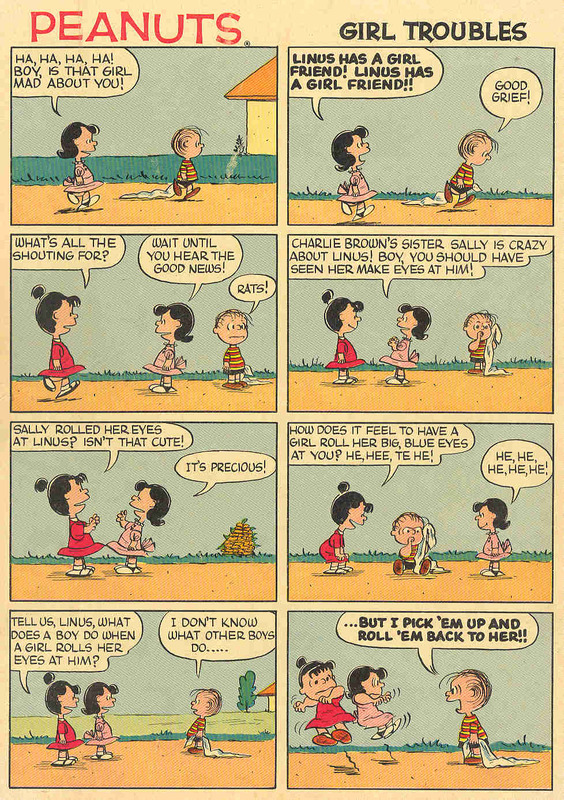 Lastly, while this piece is a tribute and study of Peanuts appearances in comic books, we've actually seen just as much artwork by the workhorse of United Features Syndicate's comic books, the great Ernie Bushmiller, long-running artist on Fritzi Ritz, and the creator of her niece Nancy, who eventually eclipsed the elder in fame and popularity. Back in UNITED COMICS #1 one-shot (Aug/40) there was a page devoted to Bushmiller, which I'll present here at the end. 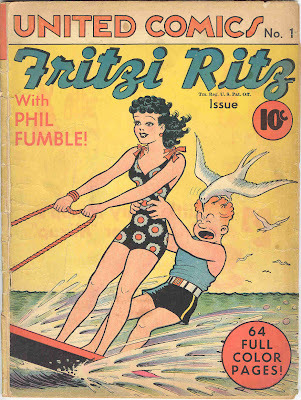 Now we know who Fritzi Ritzi's long-suffering boyfriend Phil Fumble was patterned after! 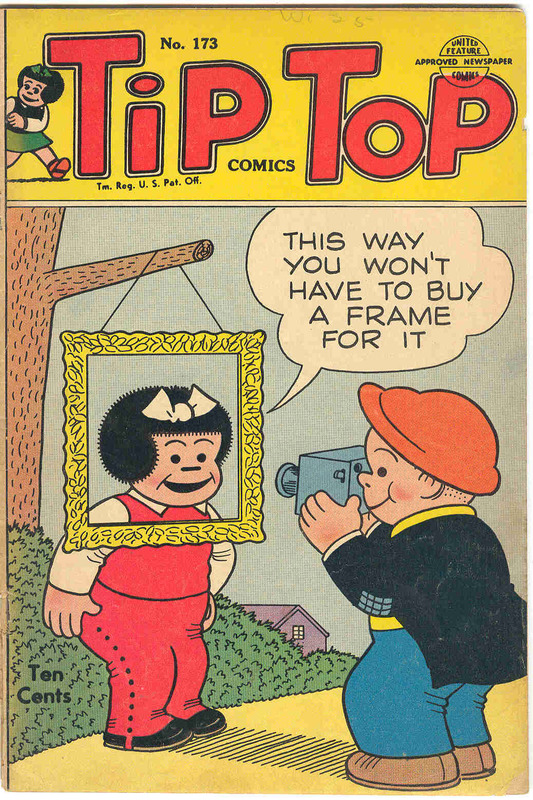 All images above are scanned from my own personal collection except for : Tip Top #186, Nancy and Sluggo #142, Sparkler Comics #115, #120. Vassallo, Michael J., Peanuts: A Comic Book History, Comics Buyer's Guide #1254, November 28, 1997, Krause Publications, Inc., Pages 60-62. The additional info and the wealth of new images make this terrific piece better than ever! Thanks Ken! And thank for hosting it for so long! Great stuff, Doc. And while not the point of the piece, I never realized how much Fritzi's boyfriend looked like Bushmiller! He really does, doesn't he? 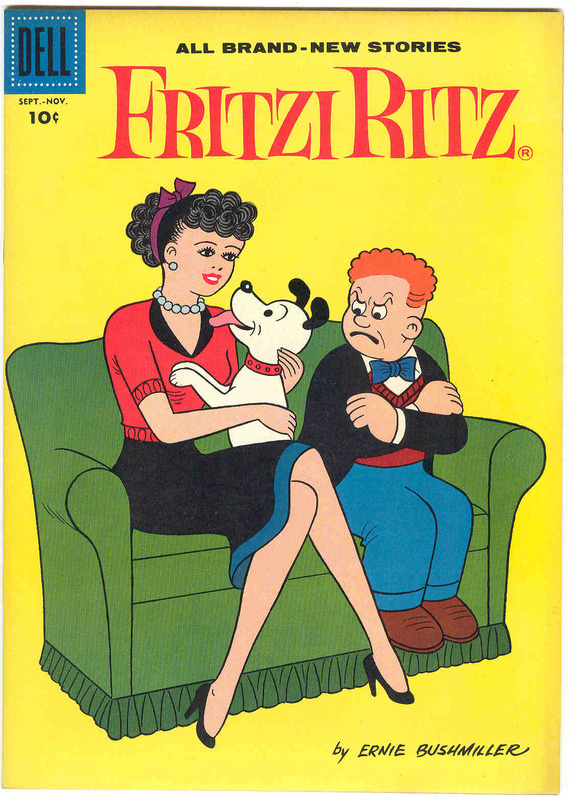 I guess Fritzi Ritz was his secret crush! This is spectacular, great! 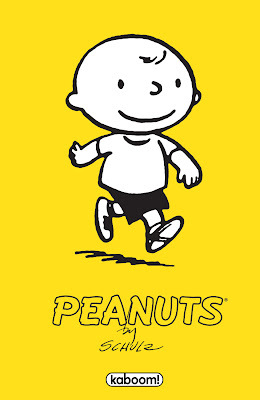 I am a huge Peanut fan! 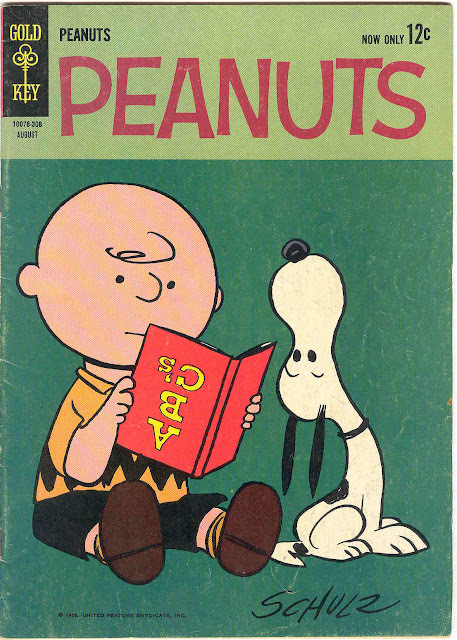 Didn't know there were so many issues featuring Peanuts! Thanks for scanning and making this post! Three cheers for Doc V.
Great to see this again in an expanded format. I especially like the one shot and Four Color # 878 covers. 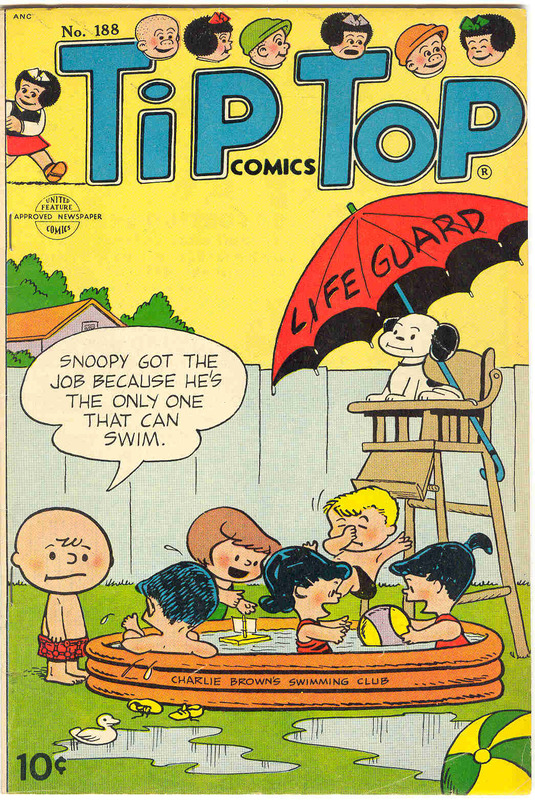 Were the Tip Top covers drawn by Schulz? It looks like it to my eye, but I don't think you mentioned it in the article. Yes, I believe the United Features Syndicate TIP TOP covers were drawn by Schulz in spite of a lack of signature. 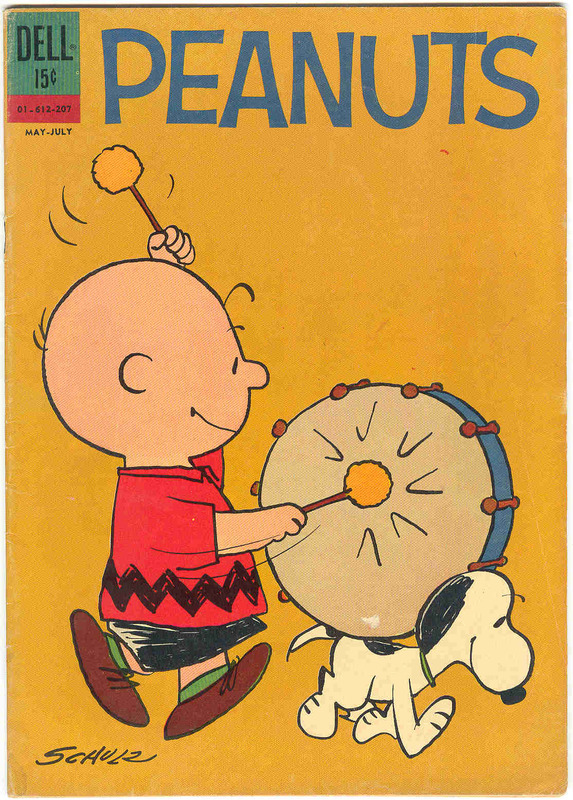 There is one cover missing, #186, which I'd like to put into the article. 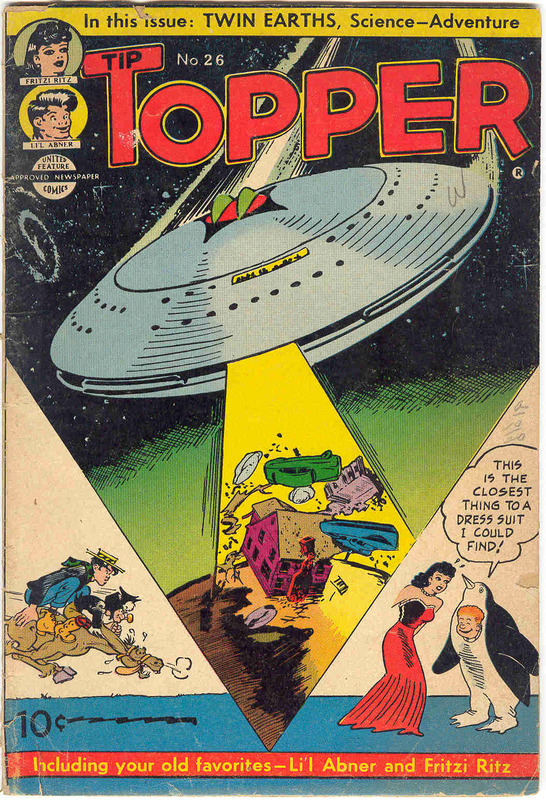 Anyone out there have a good scan of Tip Top #186? The early United Features Syndicate TIP TOP covers were likely drawn by Schulz. There's still one I'm missing and if anyone can get a scan to me of #186, I'll put it up! Great post. To correct one comment, John Stanley only wrote material featured in NANCY/NANCY AND SLUGGO and some issues of TIP TOP COMICS. There is no John Stanley artwork in these titles. I believe Dan Gormley drew the NANCY material in the Dell issues of these titles. Frank is correct, Don Gormley drew those stories. 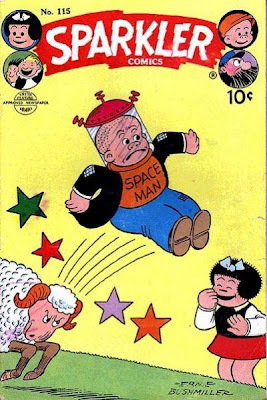 Think of the comic book issues of Mad: Kurtzman only wrote those stories as well. Thanks for the correction, guys! I'll update accordingly. I'm Justin Thompson, cartoonist and creator of 'MythTickle'. 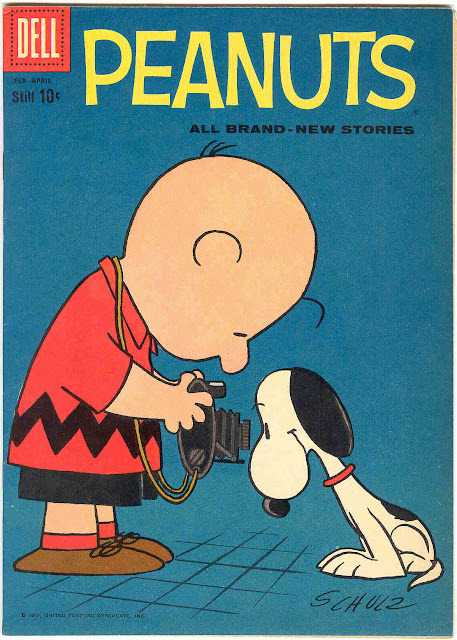 I work at the Charles M. Schulz studio in Santa Rosa, California and am one of the people who work on the new Peanuts comic books that are being produced now. I just want to thank you so much for this article. 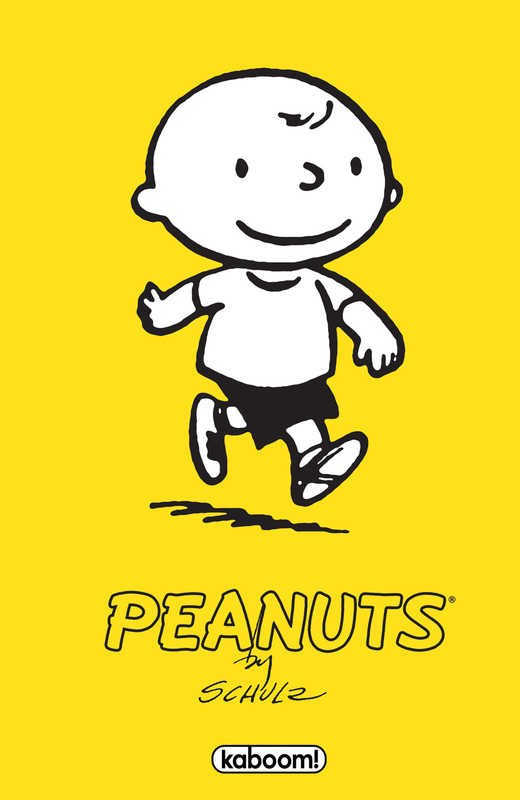 It is a wonderful resource and I really do appreciate all of the time you have taken in researching this and for your enduring love of Peanuts. You're helping us keep this all alive. Great stuff Michael, all of us here at Creative Associates love it! Thanks Justin! I'm looking forward to your books a great deal. My only regret is that I couldn't show more interior Peanuts artwork due to the fact that all those Dell issues are mint file copies! Beyond the cover, I couldn't see marring such beautiful books with creases and the like! I understand, and no need to do that. You showed enough and actually inspired me to expand on one of those interiors you posted and rewrite it for one of the upcoming issues. As I said, this post was a great inspiration. Thanks again. 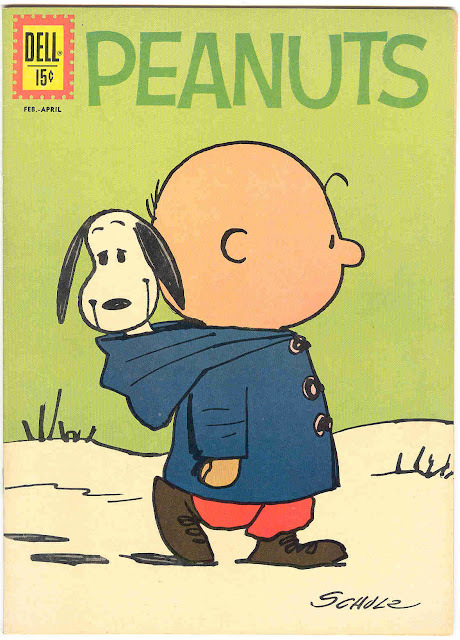 I am thrilled to see this article, being a Peanuts fan and someone who will likely never own these books (although I've held a few of them in my hands during my comic shop day.) Looking forward to the new book very much, bought the "O" issue and enjoyed that. Another great post! Thank you! More, please! Please correct me if I am wrong but it appears now that Kaboom! 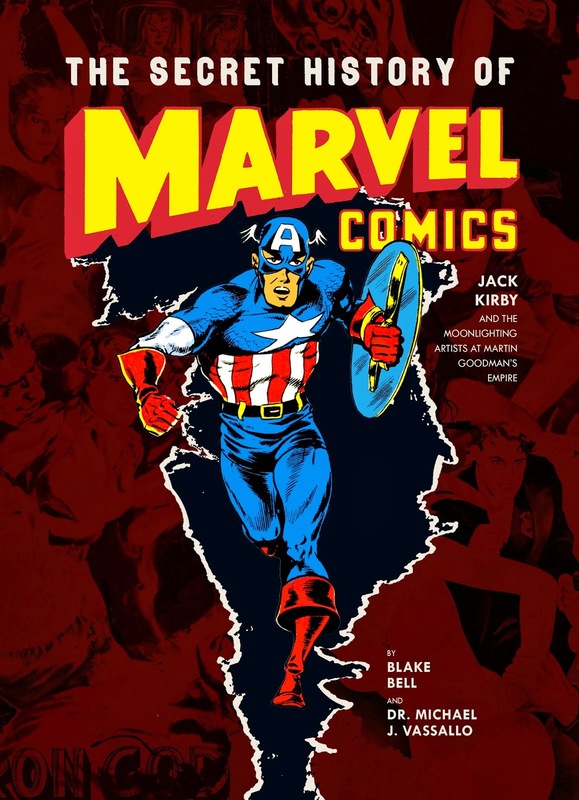 is saying that it was a four issue miniseries instead of an ongoing book.What happened? Poor sales? Thanks. I haven't heard anything yet but there is internet chatter about this. I hope not! Thanks for the reply. That is what I was afraid of. What would be the best source to find out? I hope we get #5 out soon. 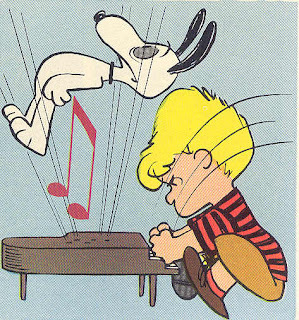 ...that it was SCHULZ HIMSELF! 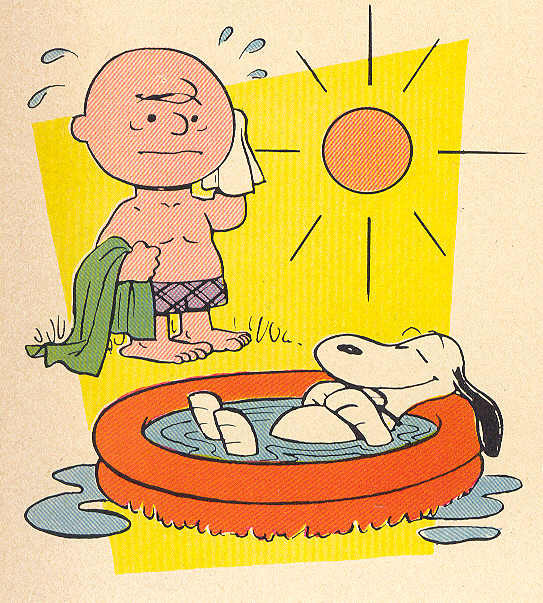 Schulz, in fact, did the inside-front single-page, and three of the four 8-page stories! The article details this starting about 1/3 of the way down, for several paragraphs, below small pix of Tip Tops 214 & 215. 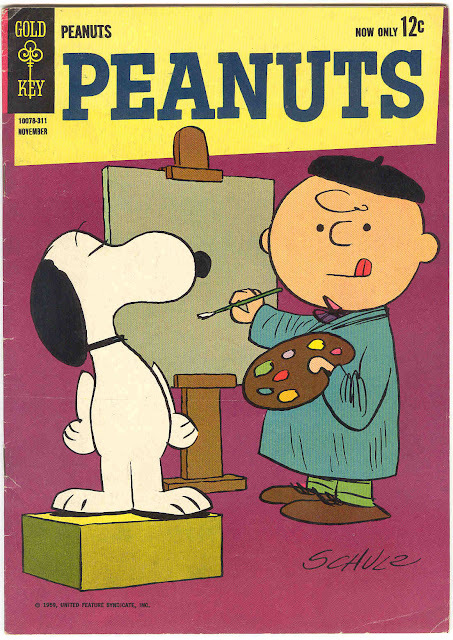 As for the next Peanuts Four-Color, #1015, Aug-Oct 1959, it came after Schulz and Sasseville parted company, but examining it shows that most of its art resembles Schulz's own hand every bit as much, if not MORE, than Nancy #146! 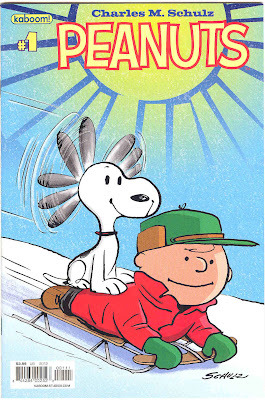 Its first 8-page story is even the first-ever story about Linus patting birds on the head! The issue's exception is a 'Snoopy' story where the artist clearly just 'copied' images of Snoopy from newspaper strips in many instances (and misspelled 'penguin'! 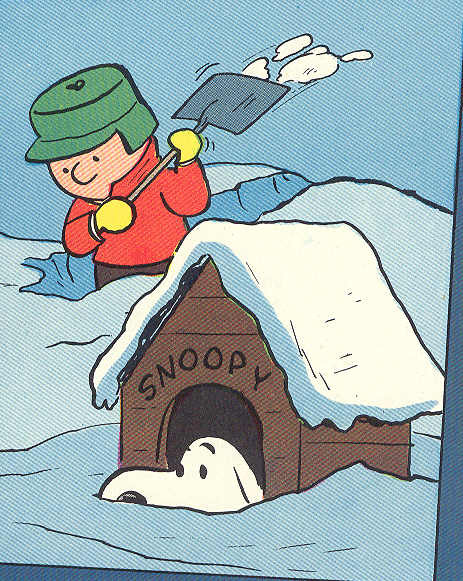 ), and I'm led to wonder if the Snoopy story in Nancy #148 is merely something similar. BTW to all appearances it seems that, sadly, aaugh.com no longer exists. and reprinted. I have the books of the strips, but there other stories, as you show, that appear to not to have ever been collected or reprinted. I notice that the Schultz Museum sells a collection of the pre-peanuts strips, but I can't for the life of me understand why this still has not been done for the other material. Thanks for doing the leg work to put this list together. 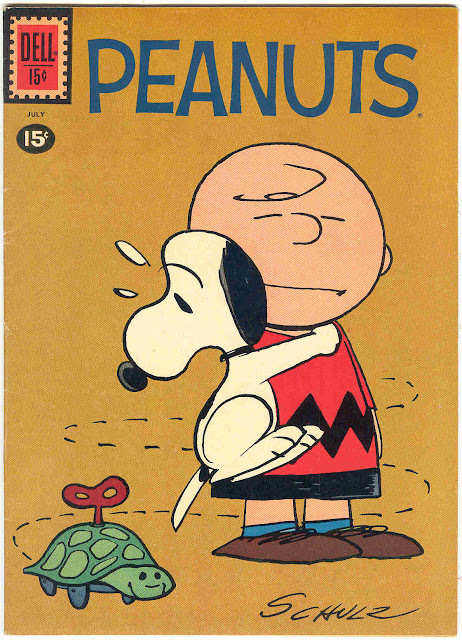 As a Peanuts fan and long time comic collector, it's very difficult to discover which UF/STJ books contained Peanuts material because, as you state, the company threw the material into their books in such a haphazard way. As I'm just starting to collect the early, pre-'55 issues, this list is a big help. Thanks again.